Drayton Park was a London Transport signal box which was opened in 1938. It was fitted with a Westinghouse Style 'N' miniature power lever frame, this installation replaced the previous 1904 mechanical lever frame signal box. Drayton Park on the Northern & City line was the only station and depot out in the open. 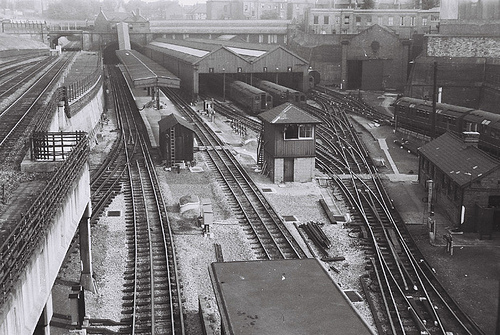 As you can see, pre 1938 standard stock was still in use.The spur on the left was the link to the LNER goods yard now used by the Great Northern who now operate the line. The main line above was the line to Broad Street,London. On the left we have the Westinghouse lever frame and its illuminated diagram in Drayton Park Signal Cabin, taken around September 1975. The left hand end of the frame and diagram would have catered for the link to Finsbury Park high level and beyond, but with the post-war cancellation of the Northern Line extensions, only the original terminal platforms at Finsbury Park remained. These were closed in 1964 as part of the Victoria Line works, leaving the frame and diagram rather 'lop-sided' until closure in 1975. This photograph was taken in September 1975, and is reproduced by kind permission of © Peter Coath. 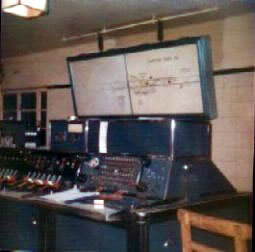 Initially opened with a switch panel controlling Finsbury Park. the lever frame was not used until 7th December 1941. The frame acquired control of Drayton Park itself from 15th March 1953, until it lost control of Finsbury Park Relay room when line closed after the 4th October 1964. Closeup of the makers plate. Pictue taken on the 28th Febuary 2009 Picture copyright © Mark Adlington.